I don't know about you, but one of my favorite perks to blogging is getting a peek into other people's lives and homes. The slice of life stuff is the best. You know, getting all up in their business. Yesterday, Edie posted about her fridge contents and what it might say about her, and I immediately thought, BRILLIANT. Or maybe I've just reached the dregs of possible blogging material. You can peek at the inside of more fridges here. If you do this too let me know, you know I'd love to peek! We are still doing spinach smoothies here too. The kids each had one for breakfast. Along with a pumpkin choc chip cookie! I can't find a sippy cup that has a hole big enough for smoothie for Eliot, so I just spoon feed hers to her. And a full fridge definitely means you are blessed. My kids help me volunteer at the food bank on occasion and it boggles their mind that people right here near us don't have food to eat. I want to know how much people spend a week for food and have been thinking about doing a post on that. I spend about $400 a week (I can get it down to $310 if I stick to my grocery list) but really why should it be that expensive to feed your family healthy whole foods and not trash? Too many condiments. Too many leftovers that will never be eaten. I even saved the potato soup I made last week that none of us actually liked. I have issues about throwing away food. Not enough "real" food. 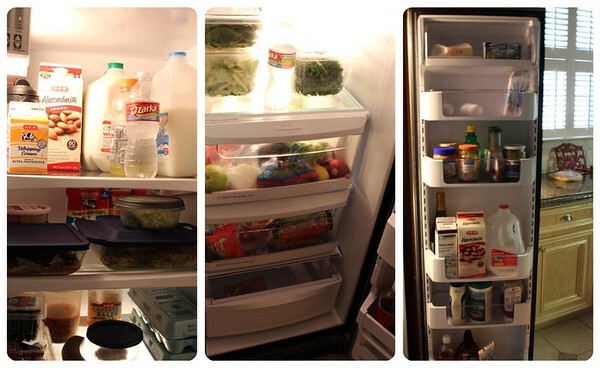 A full fridge is definitely a great thing. I'm the coordinator for a food pantry and you would be so sad to see the people who would love to have a full fridge. I think of how blessed I am everyday! love the almond milk!! we are doing good on smoothies, I am happy adding the spinach to them. my oldest nephew said he can't believe the little girl I babysit loves veggies in her smoothies. I told him the smoothie I had made him that day had spinach in it. he didn't even know it!! :) your fridge is so clean too! as for smoothie for sippy cups, the only things I have done are like the lady above, spoon fed it, used it w/ a kids cup w/ lid and straw, or just share w/ extra straw out of my own cup. any way she gets it, that little girl loves her smoothies!